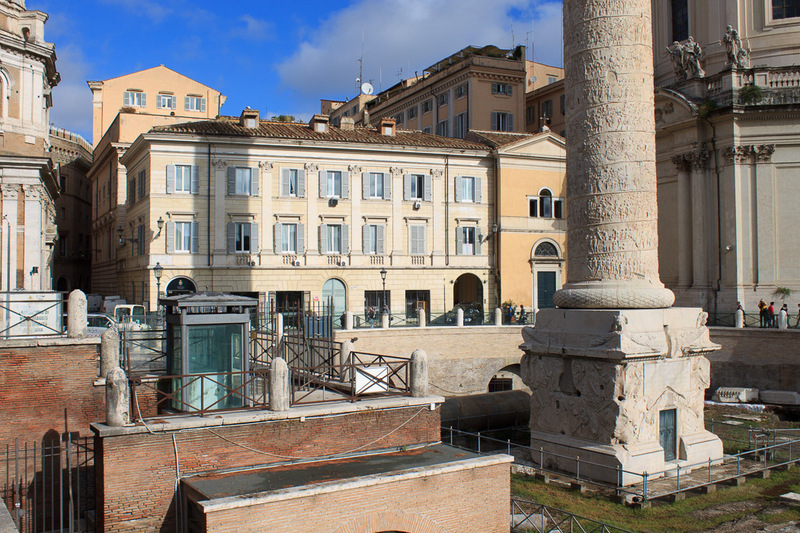 The tour at Le Domus Romane di Palazzo Valentini is a superb way to spend 2 hours in Rome. I highly recommend this attraction since it is easily the most understandable way to experience underground Rome. Unfortunately, I can't show you any photos inside the tour because photos are not permitted. But you should really just stop reading right here, buy your ticket online, and go see this attraction. You must make a reservation to get into this museum, and it'll cost you €11.50, and the tour will last about 2 hours. Only about 15 people are in any given tour, and there is a tourguide who speaks the language in which you reserved your tour. 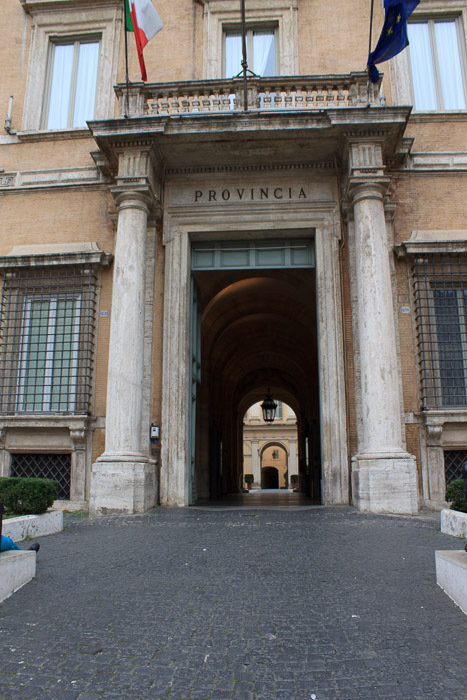 The entrance (2nd photo below) is hard to find; it's through the courtyard of Provinci di Roma at Via IV Nov 119/A, across the street from Via de Cordonatta. The nearest metro stop is Cavour, but I'd recommend trying to time your visit such that you see it when you're looking at the Imperial Fora, the Museum of Imperial Fora, and/or the Victor Emmanuel Monument, since it's close to all of them. See all Le Domus Romane di Palazzo Valentini photos. So what's the big deal? When you enter with your tourguide and small tour group, you'll descend some stairs and be in the excavated basement of the palazzo. You'll be standing on a glass floor that's been built above the Roman ruins, able to walk freely over the ruins and see everything very well. But of course, it's still "just" Roman ruins, and it will be very difficult to understand what you're looking at. Well it won't be once they start the multimedia show. The story of the ancient Roman dwelling you're standing above will be told, and spotlights will point out what's being talked about. Movies will be projected onto the ruins, transforming the lifeless and often destroyed or missing ancient ruins into what they looked like and were used for back in their prime. Bathing pools will be completed and filled with projected water. That crumbled step near the corner will be reconstructed into the stairway it once started, leading to the second floor which is now completely gone, save for the small remaining clues that we would never even notice unless we were trained archaeologists. You'll walk from room to room and, by the end of the tour, will have really gotten a good feel for what a place like this was like, how the family lived back in the day, and how ruins can be professionally interpreted for an untrained public using modern technology. After this, you'll be taken to the gift shop. I, along with others in my tour group, thought this was just the last stop before we were taken back upstairs to the daylight and sent on our way, but this was only a resting point, about half way through the tour as it turns out. From here you'll be taken to watch an excellent presentation about... well... they don't advertise this, and I don't want to ruin anyone's surprise. Then you'll be led through some corridors to a spectacular find, but I'm not going to tell you that, either. Finally, you'll be taken to a doorway that leads out from the basement, where you see... OK, you probably know I'm not going to blabber that secret either. You'll just have to go for yourself. I can hardly wait to go back for a second time!